On May 7th the Boxing world focused it’s attention on the T-Mobile Arena in Las Vegas, NV to see the battle between WBC Middleweight world champion Saul “Canelo” Alvarez and former Jr. Welterweight world champion Amir Khan. A fight that had two questions surrounding it. The first question was whether or not Khan, who had never previously fought above the 147lb. Welterweight limit would be able to compete effectively at a higher weight against Alvarez, a fighter who has fought at the Jr. Middleweight limit of 154lbs. for the majority of his career and held a world championship in the 160lb. Middleweight division going into the fight. Although the bout took place at a catch weight of 155lbs., it was nevertheless an interesting matchup between a fighter known for his quick hands and lateral movement in Khan and a compact boxer/puncher in Alvarez, who much like Khan can box, but is also known for his punching power having scored knockouts in thirty-two of his forty-six career victories prior to this fight. It was crucial in my eyes that Khan implement a tactical strategy with an emphasis on attempting to use his lateral movement and hand speed to out box Alvarez over the course of twelve rounds. It was not surprising based not only on the danger Alvarez posed as a power puncher, but more importantly the skill he also possesses as a precision counter puncher to see Khan begin this fight looking to establish himself as an elusive target. The challenger was able to immediately show that the move up in weight would have no effect on his hand speed as the first significant punch landed in the fight was a hard right hand flush on the jaw of Alvarez by Khan. It was clear that Khan had an advantage in terms of speed over the champion. What impressed me in particular was Khan’s ability to execute his offense in spurts while being elusive and making Alvarez, a fighter who likes to play the role of counter puncher come forward and attempt to land offense while trying to cut the ring off from Khan. The second round in particular may well have been Khan’s best round in terms of being able to make Alvarez come forward and more importantly miss the target as Khan was able to use his hand speed to land his offense, but also use his lateral movement to offset Alvarez as he attempted to return offense. Khan was also able to show that he could withstand the punch of a Jr. Middleweight/Middleweight as he took a couple of solid left hooks on the chin from the champion in the early rounds. Khan’s ability to execute his offense in spurts of small combinations I felt dictated the first four rounds of this fight and it appeared to me that Alvarez was having some difficulty landing on an elusive target. Alvarez however, was able to have sporadic success in landing some of his offense. In the first four rounds, I simply felt that Khan was able to execute his offense more effectively than the champion. As the fight progressed Alvarez was able to find some success in landing offense to the challenger’s body. Although I felt that Khan had won the first four rounds of this fight convincingly based on his ability to effectively box Alvarez, the champion’s gradual work to Khan’s body seemed to have some effect in rounds four and five. It was in the fifth round that I felt Alvarez was able to be the more effective of the two fighters as he landed effectively to the body and head of Khan. For Alvarez, it was his best round of the fight up to that point in the eyes of this observer. It was in round six however, that the fight would be brought to a sudden and dramatic conclusion. Alvarez continued to step up his offense and close distance between himself and Khan landing punches to the body and head as well as cutting the ring off and thus limiting Khan from being able to effectively move from danger. Although Alvarez was starting to dictate how the fight was being fought in my eyes, the end of this fight came so suddenly as a perfectly timed counter overhand right over a jab from the challenger landed flush on the jaw of Khan knocking him out cold. 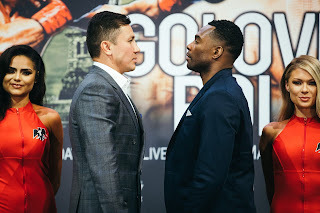 The second question that surrounded this fight was whether or not the winner would agree to face undefeated unified WBA/IBO/IBF Middleweight world champion Gennady Golovkin in their next fight. It is no secret to regular readers of The Boxing Truth ® that this observer has been loudly calling for Golovkin, a fighter with sixteen successful title defenses and twenty-two consecutive knockouts to get an opportunity to face a fighter who is considered a marquee star of the sport. Readers may recall following Golovkin’s title defense over Dominic Wade last month, I stated that although we did not know at that time who would emerge victorious between Alvarez and Khan that if the winner wanted to be taken seriously as not only a “Middleweight World Champion”, but also as a fighter recognized as a star of the sport that the winner should face Golovkin, who has more than earned the chance to show what he can do on Boxing’s biggest stage. Readers may also recall following Golovkin’s second round knockout over Wade that I reinforced my stance regarding the concept of “Catchweight” fights and it was and is time for Golovkin to get the “Marquee” or “Super Fight” normally reserved for the sport’s biggest stars saying in closing of my coverage of Golovkin-Wade it is a fight that Golovkin has not only earned, but should not have to go down in weight to “Catch.” Simply put, when you have two fighters each holding portions of a world championship in the same weight class, those two fighters should meet at the weight class’s designated weight limit if they are going to face each other to determine who is the number one fighter in that division. Even though Saul Alvarez has fought twice in bouts for the WBC Middleweight world championship, he has fought both of those fights at a “Catchweight” of 155lbs. This could lead some to question whether or not Alvarez would be willing to face a fighter without the “Catchweight” stipulation at the Middleweight limit of 160lbs. Although there is no word as of this writing as to whether or not a battle between the WBC world champion Alvarez and the unified WBA/IBO/IBF world champion Golovkin could become a reality perhaps as soon as later this year, it interests me to see what role the World Boxing Council (WBC) will play if any in bringing this fight to fruition. After all, Gennady Golovkin in addition to holding three of five recognized world championships in the Middleweight division also holds interim championship status in the WBC’s Middleweight ratings per his victory in a title defense in October 2014 over previous WBC number one contender Marco Antonio Rubio. Even though this observer has stated more than once that Golovkin’s designation of holding interim status in the WBC’s ratings does not mean much in the overall picture because Golovkin was a unified world champion prior to his victory over Rubio, I also stated following Golovkin’s recent victory over Dominic Wade that I believed it was time WBC to step in and ensure that Golovkin get the opportunity to face the winner of Alvarez-Khan. Although it has been stated that the WBC will strip Alvarez of its Middleweight world championship if a fight between the two is not made in the near future, we will simply have to wait and see how the WBC and/or the respective promoters sort everything out. It should not be overlooked however, that early estimates for the Alvarez-Khan pay-per-view card, which featured four fights, with three of those fights ending in knockouts did reportedly around 600,000 total buys. Although that figure would differ significantly from some estimates that were given before the fight of potentially a million to two million buys, it is important to remember that most of Boxing’s marquee pay-per-view events over the last decade have underperformed expectations. Whether or not it is due to the ever-increasing price tag for these cards or as I have said in the past a perceived lack of quality of those cards by Boxing fans is a question that cannot really be answered. This observer believes even in an era where Boxing has returned to over the air (OTA) Broadcast television and where consumers have gradually been making the transition away from the cable/satellite medium to over-the-top (OTT) digital distribution over internet platforms that if the right fight is put together at the right time it will succeed no matter how it is distributed. Although the fight between Floyd Mayweather and Manny Pacquiao in May of last year broke all existing pay-per-view records generating more than 4.4 million pay-per-view buys, Boxing fans were asked to wait nearly a decade for that fight to come to fruition. Even though there is no doubt that Mayweather-Pacquiao was a significant success, there was also significant backlash after the fight as many fans felt the action in the ring did not live up to expectations and felt they did not get their money’s worth. Whether Alvarez-Khan was merely affected by fans still feeling dissatisfied after paying $100 to see Mayweather-Pacquiao is a matter of opinion. It is clear however, that the biggest fight that can be made in the sport as of May 2016 would be a battle to further unify the Middleweight division between Saul Alvarez and Gennady Golovkin. As the sport as well as the methods of television consumption appear to be in transition, this would be a fight that would be universally welcomed by Boxing fans and experts alike. It is a fight that should be made as soon as possible while interest, anticipation, and discussion regarding a potential Golovkin-Alvarez showdown is high. We have seen at times in the past when Boxing fans are asked to wait a significant period of time for anticipated showdown between two stars to materialize that when the actual fight takes place it can ultimately leave the Boxing fan/consumer disappointed. It is my hope that there will not be a significant period of time for Golovkin-Alvarez to become a reality. What’s Next For Erislandy Lara?